Brian Howard Clough OBE was one of the all-time greats of English Football, both as a player and a manager. As a player for Middlesbrough and Sunderland, Clough boasted an almost unthinkable goalscoring record by today's standards, of 251 goals in just 274 appearances, before injury prematurely ended his playing career. As a manger, Clough became known as "The greatest manager England never had" having been interviewed for the job in 1977, only to be passed up, with the job instead going to Ron Greenwood. Clough's management career began in earnest, at perennial strugglers Hartlepools United, who has finished bottom of the 4th division five times in the previous six seaon's prior to the appointment. Such was the club's parlous financial state, Clough had to tour local pubs raising money to keep the club afloat and even applied for a coach driver's license to drive the team to away matches. In the 1966-67 season Clough, and assistant manager Peter Taylor led Hartlepools to a respectable 8th placed finish. Amongst Clough's signing's was a 16-year old John McGovern who would go on to play twice more for Clough, at Derby County and Nottingham Forest. In May 1967 Clough and Taylor left Hartlepools to take over at Second Division Derby County, who had been in the division for fifteen years, fininshing in the bottom-half of the table every season for the previous decade. In his first season in charge Derby finished a place lower in the table, than in the previous season, but Clough and Taylor had begun to lay the foundations for future sucess signing several new players, and only retaining four, whom had been at the club previously. In 1969 Clough led Derby to the Second Division championship, establishing the club record of 22 games unbeaten along the way. Derby's first season back in the First Division saw them finish in an impressive 4th place, although the club were banned from European football due to financial irregularities. A 9th place finish followed, before Clough and Taylor took Derby to the top of the table, becoming English Champions in the 1971-72 season. Derby failed to retain the title in 72-73 but did make it all the way to the semi-finals of the European Cup, before eventually being knocked out 3-1 on aggregate by Juventus, a side Clough famously accused of being "Cheating Bastards". Throughout this spell, Clough's relationship with the Derby board of director's was soured by Clough's outspoken nature, and his tendancy to sign player's without first consulting them (He famously signed David Nish from Leicester City for a British-Record £225,000 without informing or consulting the board), and with the relationship at breaking-point, Clough, Taylor, and his entire backroom staff resigned on the 15th October 1973, to widespread uproad from Rams fans, who demanded the board's resignation along with Clough and Taylor's reinstatement at the following home game against Leicester City five days later. Clough then went on to have 2 brief, and unsuccesful managerial reigns, firstly at Third Divison Brighton and Hove Albion, and famously, a disasterous 44-day spell at English Champions Leeds United, which would later become a novel, and a movie, named The Damned United. On 6 January 1975, Clough made a return to management with Nottingham Forest who at the time were in 13th place in Division Two. Clough made fewer TV appearances whilst Forest manager, and toned down the outspoken comments he had made earlier at Derby. After finishing 8th in the Second Division, in his first full season in charge alone, in July 1976 Clough was joined by his old assistant Peter Taylor from Brighton, who had just missed out on promotion from the old Third division. Together, Clough and Taylor transformed the club's fortunes rapidly: the first success at the club came in Clough's second full season (1976-77) when they won promotion to Division One, finishing third. In the summer of 1977 Clough was interviewed for the England manager's job recently vacated by Don Revie, but it instead went to Ron Greenwood. In their first season after promotion Forest won the League Cup, beating Liverpool 1–0 in a replay atOld Trafford, and were crowned champions of Division One, finishing seven points clear of nearest challengers Liverpool. This made Clough the first manager since Herbert Chapman to win the English League Championship with two different clubs. (Tom Watson and Kenny Daglish are the others to achieve the feat). In the 1978-79 season, Clough signed the 24-year-old Birmingham City striker Trevor Francis, Britain's first £1 million footballer. Forest missed out on the league title, finishing as runners-up to Liverpool, but made amends by retaining the League Cup with a 3-2 victory over Southampton and reaching theEuropean Cup final (knocking out defending champions Liverpool en route), which they won 1–0 against Malmo FF, with Francis scoring the winner. 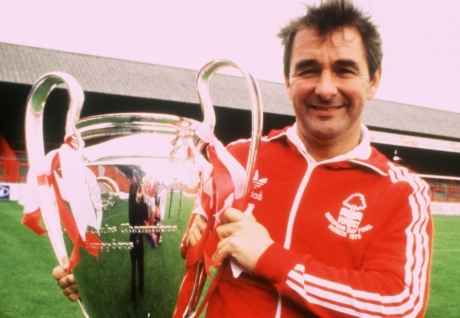 A year later, Clough guided Forest to a second successive European Cup success, this time beating Hamburger SV 1–0, and a third successive League Cup final, though they were defeated by Wolverhampton Wanderers 1–0. Despite retaining the European Cup, Clough regarded his greatest achievement to be the record breaking unbeaten run his team set between 26 November 1977 and 9 December 1978, the team went undefeated for 42 league games – the equivalent of a whole season, beating the previous record of 35 games held by Burnley. The record stood until August 2004, a month before Clough's death, when it was surpassed by Arsenal, who went on to play 49 league games without defeat. Clough would go on to win a further 2 League Cup's, and take Forest to the Uefa Cup semi-final where they were controversially knocked out by Anderlect, who would later be found guilty of bribing the referee in the match and banned from European competition. The one domestic trophy that would forever elude Clough, was the FA Cup. In 1991 Clough finally made it to the final, only to be beaten 2-1 by Tottenham Hotspur thanks to an extra-time Des Walker own goal. Despite a magnificent managerial career, Clough's time as Forest manager would end on a sad-note as the Reds were relegated in the first season of the Premier League, finishing bottom of the table in his final season before retirement. Your challenge, should you chose to accept it, is to emulate, and in some-cases; better Brian Clough's achievments. Here are the rules. You must begin at a team predicted to finish in the bottom-half of League 2 by the media. You can move clubs as often as you like. With the same club, you must then win the English Premier Division. With this club, you must again lead them to promotion, and the English title, but you must also win the Champions League AND retain it. Maximum points if you can do this in 4-sucessive seasons as Clough did with Forest. You must also win 4 League Cups during your career. These can be won at multiple clubs. You must equal, or better Clough's then-English record of 42 league games unbeaten. Try to have the best disciplinary records in the league. Clough's side's were never dirty, and he famously told his "Dirty" Leeds United side, to chuck all there medals in the bin because "you won the lot by cheating". Break the World Transfer record, as Clough did when he signed Trevor Francis. Win the league title's, and European Cup at the respective clubs, with the same Assistant Manager. Clough was a brilliant manager, but it was Peter Taylor, his assistant at Hartlepools, Brighton, Derby and Forest, who made him truely special. It was Taylor who could spot the "diamond in the rough" type of unfashionable player, and Clough who would then sign the player, and mould him into the diamond. Win the European Cup 3 season on the bounce. Clough won it back-to-back, but his Forest side were then knocked out in the first round, the following season. Win 3-League Cups on the bounce. Clough twice won the League Cup back-to-back, can you do it 3 times? Win the FA Cup, the one domestic trophy that eluded Clough. Win the World Cup with England. Clough absolutley should have got the job, but the FA were too afraid to appoint such an outspoken, and controversial manager, so Clough never got the chance. And there you have it, I seriously doubt anyone will entirely complete this challenge, but I'll be interested to see if anyone can come close. Let me know if you think there is anything that should be added (although there's probably more than enough to do already ). I've not added any particularly strict rules about previous experience and stuff (although I suppose former-player would be most appropriate to truely emulate Cloughie), or a point's system, as ultimately, it's just about having fun, but if there's demand for it, I can add a point's system to crowd a winner or whatever. Sounds good. Will try this at some point I think. Will be tough though! Started with Fleetwood(UsingLFCMarshalls Update). Will post Sreenshots later. They're predicted 11th which is top half haha, good luck! It says 22nd on mine? Really? Strange, I'm using LFC update from today too. Did he release a new update today? If so, I don't have that one yet. After a very good season with Torquay finishing 6th in the league, although i lost the first game of the playoffs against Fleetwood, Peterboro offered me the job after they finished 21st in the championship staying up by just 3 points, I took the job and now have to go for promotion and then premiership glory. The tactic I will be implemeting at the club, i plan on playing a short passing game, keeping possession and pressuring when not on the ball. Villa as my main striker is probably going to be my main goalscoring man. Transfers- After looking for a parent club Fulham were the best team and they sent me Kasami, Briggs and Trotta on loan for the season. Kasami was one of my targets anyway so this was a bonus as i now needed no wages to be paid.